During the 18th century, curiosity gives way to science. Cabinets of curiosities have been progressively replaced by Cabinets of Natural History. « We moved from curiosity, enhanced by rarity, to research of series. »7 From the Enlightenment, collections have been rationalized and methodically tidied. « Each object has its own denomination »8, the elements are labelled and placed into display cases. « A cabinet of Natural History is a condensed version of whole nature. »9 The decline of cabinets of curiosities has been intitiated in the 19th century. They gradually have been replaced by institutions (Natural History Museums). In his personal exhibition entitled Just as the daylight was fading, Rodrigo Arteaga revisits cabinets of curiosities, formerly owned by intellectuals and aristocrats who were motivated by intellectual curiosity, exploratory researches or desire to expound their erudition. The artist borrows the animal, vegetable and mineral kingdoms from these private collections, wandering along knowledge paths : from the private collections to the formalization of knowledge. His work Atlas of the Physical and Political History of Chile appears like a cabinet of curiosities where are exhibited paper sculptures, from the eponymous book by the French naturalist Claude Gay. The author dedicated his life to illustrate life forms in Chili in the 19th century. The work reflects « the inherent impossibility of humans trying to understand the world by ordering it and collecting its forms. »11 The artist highlights the importance of cabinet of curiosities for the emergence of the current division of sciences and areas of thought. The installation Het Wondertooneel der Nature has been created from corals collection of Albertus Seba’s Cabinet of natural curiosities. This Dutch apothecary (1665-1736) has amassed for years one of the most important collection of plants, animals and insects in the 18th century. Albertus Seba commissioned illustrations of his specimens, which have been collected in a catalogue (4 volumes). Rodrigo Arteaga cut the corals illustrations at the scale of the book and reorganized them from a print of Levinus Vincent’s collection (1658-1727). 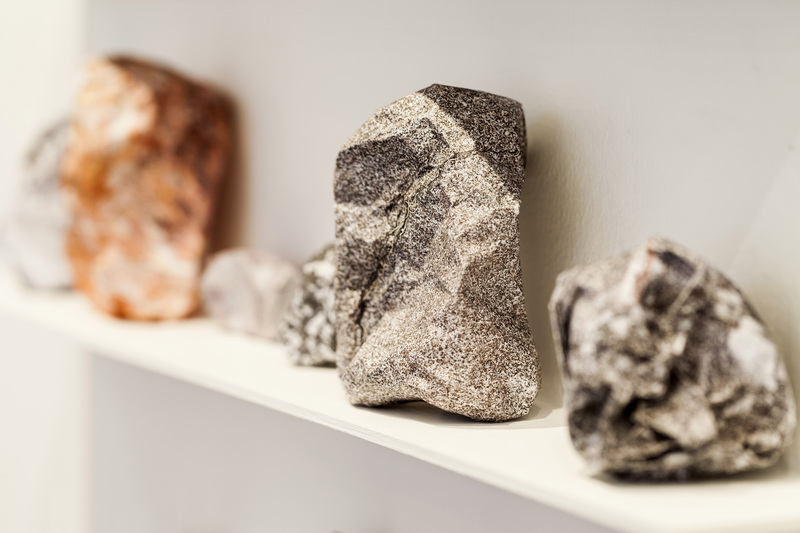 Collection of rocks is a paper sculptures installation made of photographs of different Andes Mountains rocks. Textures and volumes resemble stones. The sculptures are displayed like minerals in Natural History Museums collections. The ink drawing entitled Entomology cabinet is in line with the graphic language of 17th century prints. For entomologists, botanists and researchers, illustrations were and still are a medium to represent and pass down knowledge. Furthermore, Observations on botanical illustration, which is composed of a photograph and a drawing of a same plant, shows the limits of botanical representation. 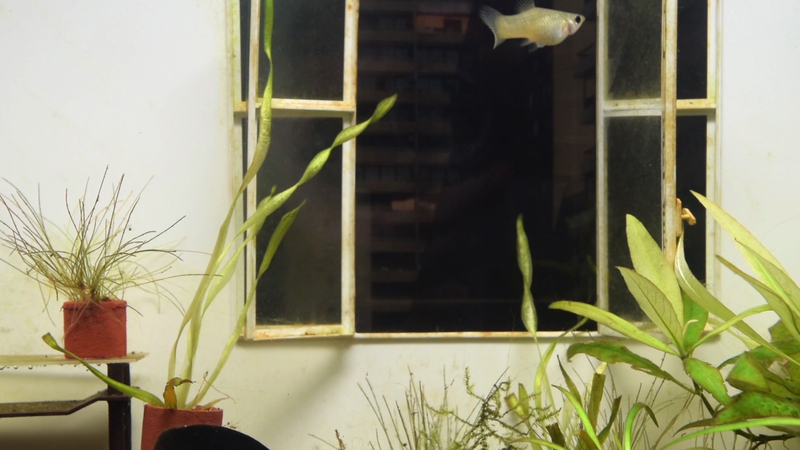 For his project Öekologie, Rodrigo Arteaga sculpted his living room at the scale of an aquarium, in order to understand « our ways of conventionalizing space and the limit between the natural and the artificial. »12 By reproducing the habitat, the artists questions the artificial environments in which living beings are held. This reflection is also developped in the work Plant observatory, a scale model of a greenhouse built in 1853 in Santiago (Quinta Normal Park). Since 1995, this National Historic Monument of Chile has been abandoned. The greenhouse should originally contain worldwide exotic species, but nowadays the deserted building only contains ruins of its glorious past. Rodrigo Arteaga’s personal exhibition Just as the daylight was fading highlights our empirical relation to nature as much as our ways to formalize knowledge in order to comprehend our environment. By categorizing species and naming families and branches, we rethought the human place in nature. 1/ AQUINAS THOMAS , Summa theologica or Summa theologiae, II-II, Questions 166 et 167, 1266-1273. 2/ In opposition to « do not care ». 3/ Definition of « curiosity » in Dictionnaire de Trévoux, 17th century French Dictionary, 1704-1771. 5/ ROCHAS, Joëlle, L’Influence des naturalistes et des cabinets de curiosités germaniques dans la genèse du Cabinet d’histoire naturelle de Grenoble (1773-1839) : le cas du cabinet de curiosités de l’archiduc Ferdinand II du Tyrol, curiositas.org, a project by Poitiers University. 6/ BOETSCH, Gilles ; BLANCHARD, Pascal, « Du cabinet de curiosité à la « Vénus Hottentote » : la longue histoire des exhibitions humaines » in L'invention de la race: Des représentations scientifiques aux exhibitions populaires, sous la direction de BANCEL, Nicolas ; DAVID, Thomas ; THOMAS Dominic, La Découverte, 2016, 548 pages. 7/ DE L’ESTOILE, Benoît, Le goût des Autres, De l’exposition coloniale aux Arts premiers, Collection Champs Essais, Flammarion, Paris, 2007 (réédition 2010), 624 pages. 8/ DIDEROT, Denis ; D’ALEMBERT, Jean Le Rond, Encyclopédie Ou Dictionnaire Raisonné Des Sciences, Des Arts Et Des Métiers, Briasson, 1751, October 6th, 2010, 871 pages. 10/ Rodrigo Arteaga, about his project « Just as the daylight was fading », Sobering Galerie, September 2016. Previous Previous post: François Arnal. Life through the prism of aerosol.